Ursula Le Guin's masterful works pushed readers to expand their vision of what's possible. Ursula K. Le Guin was beloved. Her novels, poems, musings on her cat Pard, and her exhortations to speak truth to power endeared her to millions. Writing a fitting tribute to such a person is a daunting task, not least because while I’m a long-time fan of Le Guin, I’m not a fangirl. I’ve aggressively pushed The Left Hand of Darkness on uninitiated friends, but I don’t recall the ins and outs of the Hainish Cycle with any clarity, and beyond knowing that Le Guin was an Oregonian with interesting parents and hobbies, I haven’t pored over the biographical details of her life. Nonetheless, I feel compelled to join the chorus of sorrow and remembrance. Ursula Le Guin’s stories have shaped my sociological imagination in ways rivaled only by my early forays into political economy. Indeed, my discovery of Le Guin coincided with my discovery of Marxism; the two ways of thinking seemed perfectly complementary. But the appeal of Le Guin’s vision for me was deeper than her politics — I fell in love with her method. Le Guin was a materialist. Her linking of capitalism with kings hints at this materialism — an emphasis on history that both Le Guin and dyed-in-the-wool historical materialists like Ellen Meiksins Wood and E.P. Thompson exhibited.
. . . allows no pre-ordained or unilinear sequence, in which . . . capitalism — or any other mode of production — is something that needs to be explained, not presupposed, and which looks for explanations not in some transhistorical natural law but in historically specific social relations, contradictions and struggle. Le Guin was a master at seeing and constructing social relations. She was a world builder. She could craft a world in a few pages — The Ones Who Walk Away from Omelas — or through an epic tale — The Dispossessed. Her worlds were, to my mind, designed with the eye of a historical materialist; each one captured the social relations, contradictions, and struggles that define society. Her many protagonists’ — Tenar, Selver, Ai — personal battles against racism, sexism, colonialism, and tradition encapsulated real-life dynamics between structure and agency in an unparalleled way. Le Guin’s interest in the collision of biography and history fostered a career-spanning interrogation of the human desire to shape society. In The Word For World is Forest, society is shattered by brutal colonists from Terra, in The Left Hand of Darkness we see the machinations of “soft power” and diplomacy, and in The Lathe of Heaven and The Dispossessed Le Guin grapples with the desire for utopia. In a moment when the deep crisis and contradictions of neoliberal capitalism have sparked a return of the utopian (and dystopian) impulse, Le Guin’s treatment of the subject is more relevant than ever. Both Lathe of Heaven and The Dispossessed (with its crowdsourced subtitle An Ambiguous Utopia) are cautionary tales, highlighting the conflict between utopian desires, historicity, and societal structures. Lathe of Heaven features an ambitious psychiatrist’s attempts to use the protagonist’s “effective dreams” (which change reality) as shortcuts to solving the deep societal problems of racism, environmental collapse, poverty, and war. The results are horrific: nuclear war, autocracy, alien attack, and grey skin for everyone. The Dispossessed explores life in an anarcho-syndicalist colony on the barren planet Anarres; the novel undercuts prescriptive utopian fantasies with thorny questions about ambition, collectivism, and power. Both stories are rooted in a materialist worldview, highlighting how our interactions with nature produce the conditions of life. There is no unfolding or endpoint; there is a vision and an ongoing struggle for something better — a worldview that echoes the politics of real-life figures like Ella Baker. The point of historical materialism was always about interpreting the world in order to change it. The romantic in me believes in the power of art, hews to the notion that the worlds created in speculative fiction hold the possibility of changing the one we live in for the better. At the very least, stories like the ones told by Le Guin highlight the inseparability of culture and capitalism. A long time back, on a northbound NJ Transit train, I saw a poster for an upcoming Sci-Fi Channel miniseries based on Le Guin’s Earthsea books. Exciting — until I realized that the blond-haired, blue-eyed guy in the middle of the poster was meant to be Ged. 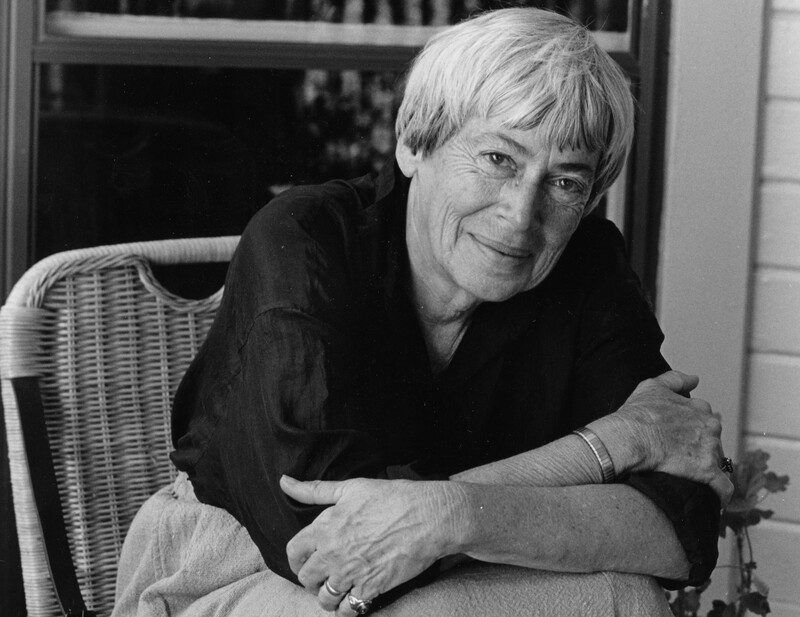 Le Guin took her role as a world creator seriously and was a vocal critic of the fact that fantasy and science fiction were primarily concerned with “the adventures of white people in white worlds.” Speculative fiction is still grappling with racism and sexism, but Le Guin, alongside greats like Octavia Butler, forced the genre into a new, more radical direction. Le Guin’s materialist vision and passionate interrogation of society enabled her to create true masterpieces, elevating fiction and, most importantly for me, our vision of what is possible.